I’m sure I don’t need to tell you all about today announcement by the Defence Secretary in the House of Commons explaining the Government’s decision to backtrack and purchase the STOVL version of the F-35 Lightning Joint Strike Fighter, instead of the conventional carrier version. The original plan was, of course, to purchase the STOVL version – ie F-35B – as replacement for the Harriers, to operate from the new Queen Elizabeth Class Carriers. The coalition has now performed two u-turns on the Joint Strike Fighter issue. First, soon after coming into office they abandoned the vertical take-off verson, in favour of the higher performance variant. Now, having seen the costs for installing catapults and traps on the aircraft carriers spiral, they have decided to go back to the vertical take off variant. One cannot help but feel that this constant to-ing and fro-ing has probably added a significant amount to the cost, for no discernible gain, and will almost certainly delay their introduction into service. And as anyone who has worked in retail will tell you, there is nothing more annoying than a customer who keeps changing their mind every five minutes. It’s bad enough if someone is buying a book or a loaf of bread, but 50+ fighter aircraft? The lack of range is apparently due to the B version having to accomodate extra plant for vertical landing, which eats into its fuel capacity. I’m not sure if it’s just me, but the differences do not seem too critical – isn’t the beauty of an aircraft carrier that you can move it 100 miles closer in if need be, and if safe to do so? Apparently the B version will be able to carry less weapons than the C version as well, however I am having trouble finding firm specifications for this. 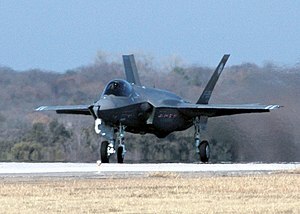 It should also be remembered that the B version will, in theory, be able to operate short-term or in an emergency from other ships that have landing spaces, or from rough airstrips on land – neither of which the F-35 C can do. By way of a contrast, the Sea Harrier had a combat radius of 540 nautical miles, but didn’t have such a high performance as the F-35 in other respects. I seem to recall that the SHAR was hardly bristling with armaments either. The decision making regarding the Joint Strike Fighter project has been flawed from day one. Perhaps setting out to buy the STOVL versions was not the wisest decision in hindsight, but to decide to switch to the C version, and then back to the B version again in a year shows a serious case of indecision and narrow-mindedness. A decision that was supposed to save money in the long run, ended up costing us more money in the short term and not happening anyway. Let’s hope that this kind of defence procurement strategic direction never transgresses into decision making in war. Still, I cannot help but feel that we would have been far better off purchasing some F-18’s off the shelf in the first place – both in terms of cost and capabilitity.